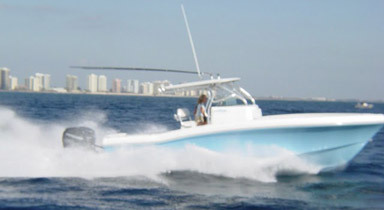 Typhoon boats are built to the highest standards and are truly high speed, blue-water, open ocean vessels. Our stepped-hull-bottoms are two decades of continuous development and production. 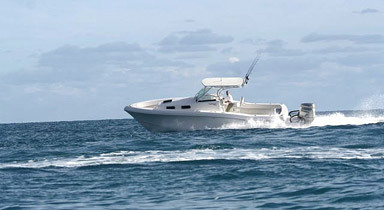 Designed on proven hulls, with safety, fuel economy, sea keeping capability and comfort the primary objectives. We start our hull design procedure by giving the multi-stepped hull a Typhoon boats are built to the highest standards and are truly high mission: a high speed (handles 50 plus mph), stable but soft riding (a compromise between tenderness and stability, 22 degrees dead rise), developed hull lines, wide beam to length ratio (wide passage ways around the center console fishing platform), fine entry forward, reverse chine’s, sufficient bow overhang and Carolina flare, delivers a stable, soft riding, dry air-cushioned ride.